When hurricane season rolls in, it can leave entire communities scared, desperate, and often ill prepared. These storms grow to massive proportions as they form over the water moving inland. Threats from hurricanes include high winds, storm surge, heavy rainfall, tornadoes, and coastal as well as inland flooding. It’s important to know how to prepare for a hurricane or extreme flood, for the safety of you and your loved ones. Let’s go over a few basics that can get you ready for the worst-case scenario and more at ease when an incoming hurricane knocks at your door. Have a plan for where to go. If you receive the order to evacuate, you should be aware of the local hurricane evacuation routes. You should also have a plan of where to stay once you do evacuate. Put together a go-bag. This is a disaster supply kit that should include but is not limited to: a flashlight, first aid supplies, medications, and copies of critical information, should you need to evacuate. Supply your home. If you are in an area that is not evacuated and decide to stay, plan to have adequate supplies ready in your home. You could lose power and water for several days and may not be able to leave due to flooding or blocked roads. Plan ahead. Have an emergency plan prepared and communicate to your family what exactly needs to be done. Listen to alerts. Many communities have a text or email alert system for emergency notifications. Make sure you know those systems and contact your city or county office if you have any questions. Secure loose rain gutters and reinforce the roof, windows, and doors (including the garage door). Clear clogged areas or debris from your home to prevent damage. This includes trimming and clearing away any dead or lost branches from trees on your property. Purchase a portable generator to use during power outages. Remember to keep this outside at least 20 feet away from windows and doors. Make sure you are getting the latest weather updates and emergency instructions. Build or restock your emergency preparedness kit. Make sure you have enough food and water for at least 3 days. Plan how to communicate with family members so that no one gets worried. Texts are usually more reliable during and after a storm because phone lines are overloaded. Keep your car in good working condition and keep the gas tank full. Have your car stocked with emergency supplies and a change of clothes. Have a quick link to your city/county webpage to get quick access to storm updates. Trim or remove trees that are close enough to fall on any building structures. Cover all of your home’s windows. Permanent storm shutters offer the best protection. You can also board up windows with 5/8' exterior grade or marine plywood. Cut it to fit, and it’s ready to install. Keep updated via TV or radio and continuously check the city webpage for updates. Make sure your cell phone and any portable charging packs are charged and ready for when the power goes out. Let your friends and family know where you are, whether you are staying home or evacuating. Close storm shutters and stay away from the windows. Turn your refrigerator and freezer to the coldest setting and open them only when necessary. This will help your perishable food last longer. Once the storm has passed, there is a good chance there will be some flooding, and this is another thing you will need to be prepared for if you choose to stay and ride out the storm. Do not attempt to drive through areas that are flooded. There can be an undercurrent that can get out of control fast. Avoid standing water, as it could be electrically charged from downed power lines. Photograph your property for any damage for your insurance company (both flood and hurricane). Beware of areas where the water has receded, as it can make the roadways weak. Stay on higher ground, especially if there is a flash flood warning in effect. Any big storm taking aim at your home and community can be scary. Try to remain calm and have all the information you need to keep you and your family safe. By taking these steps on how to prepare for a hurricane, you will make it much easier on you and your family when the storm does come through. Should you be told you are in an area that needs to evacuate, take that advice and relocate to a safer location. Luckily, now you should have your car and bags all set and ready to go! 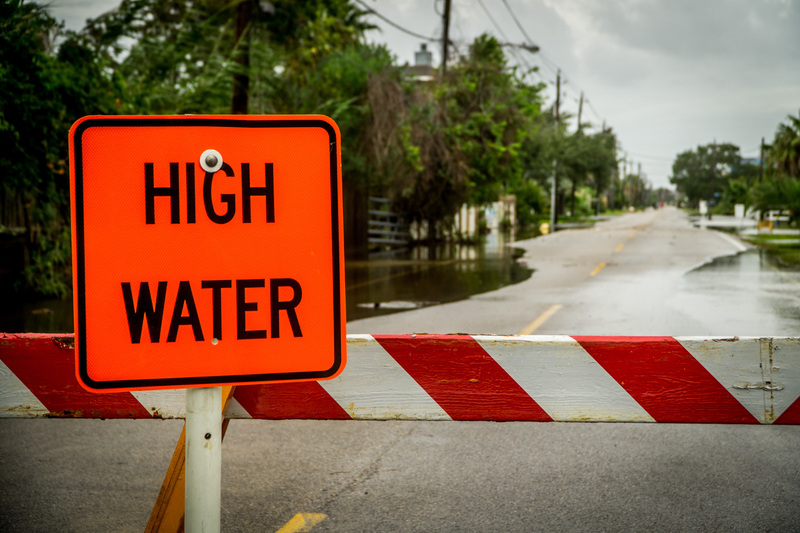 If you want more information on hurricanes and other storms, here’s a blog from Advanced Water Solutions that goes over how to avoid contaminated water after such an emergency.